The phenomenon Stone Mushrooms was formed in the territory of Southern Bulgaria. The interesting formations of the Rocky mushrooms are about 1 kilometer north of the village of Beli Plast, directly on the road between the towns of Haskovo and Kardjali. The Stone Mushrooms are located in a secure area of the southern Rhodope. Interesting is the fact that the phenomena have formed an area of three hectares. This area was declared a landmark on May 13th in the year of 1974 by Order of Ministry of Environment and Forests. An additional charm and richness of the natural area is that it gives a huge variety of birds. Around the Rocky mushrooms you can see the rare-toed Eagle, Red-rumped Swallow, Egyptian vulture, and typically Spanish Wheatear. Extremely beautiful the rock phenomenon Stone Mushrooms has actually eroded several entities with clear forms of large mushrooms. Their appearance is so proportionate and harmonious, that you can not confuse them with nothing and all specimens of Stone Mushrooms were nearly equal size, with only minor discrepancies. The height of the natural attractions in this part of the Rhodope Mountains is about 2.5 meters. So is the thickness of layers, which are formed. 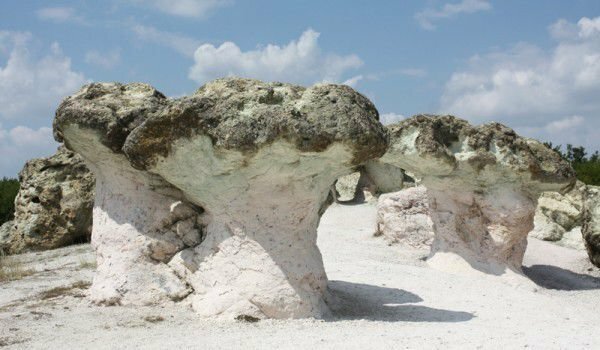 The Stone Mushrooms have emerged as a result of erosion in the volcanic tuffs and occurs simultaneously in two layers of tufts of different mechanical properties. Other colors found in the Stone Mushrooms other than pink is the "field" Stone Mushrooms. As a result of the impact of Mother Nature they are blue and black. The Stone Mushrooms were formed a long time ago, back in the era of the Paleogene. 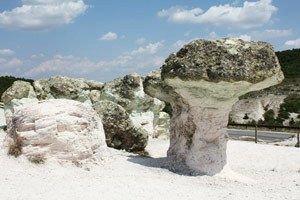 At that time it was there that the seabed and Stone Mushrooms gradually formed as a result of the underwater volcanic activity. Once the water had already gone to this place and the intensive erosion processes began, as a result of natural influences of rain, sun and wind. The reason for the strange shapes of the Stone Mushrooms is hiding in the mineral composition. The minerals comprising the hats of the mushrooms are healthy and more stable than those forming the body which has led to varying degrees of erosion.